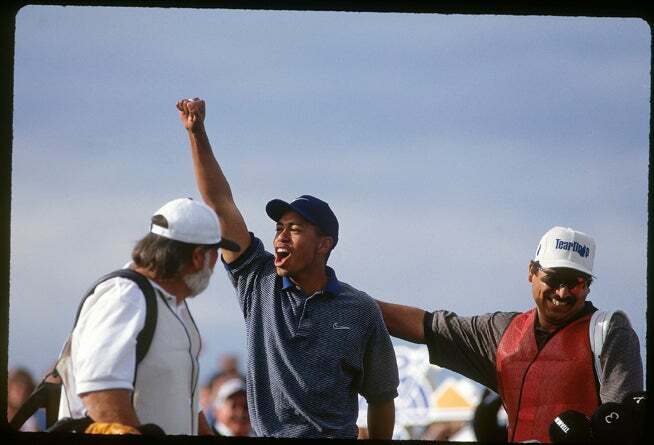 Woods won the 1997 Masters three months later. Tiger Woods confirmed Golf.com's report that he will begin his 2015 PGA Tour season at the Waste Management Phoenix Open with a blog post on TigerWoods.com. Woods, 39, last played the event in 2001, when he tied for fifth. His most memorable moment was his debut in 1997 when he made a hole-in-one at the par-3 16th hole to send the capacity crowd into a frenzy. This year's tournament begins on Jan. 29 and ends Feb. 1, also Super Bowl Sunday in nearby Glendale. "It will be great to return to Phoenix," he said on his website. "The crowds are amazing and always enthusiastic, and the 16th hole is pretty unique in golf." Woods also committed to play the Farmers Insurance Open at Torrey Pines in San Diego the following week. Torrey Pines has been lucrative for Woods throughout this career. He has earned $7.4 million at the course with seven victories in the Farmers Insurance Open (1999, 2003, 2005, 2006, 2007, 2008, 2013) and one U.S. Open victory (2008). "Torrey is a very important place to me," Woods said. "My pop took me there when I was younger, and I have a lot of special memories of watching the Tour play there when I was growing up." Woods is looking to rebound from an injury-plagued 2014 season where he only played in seven events and missed the cut or withdrew from three. His highest finish was a tie for 25th at the WGC-Cadillac Championship in March. For more news that golfers everywhere are talking about, follow @golf_com on Twitter, like us on Facebook, and subscribe to our YouTube video channel.